Located in Newcastle at the foothills of the Mountains of Mourne, Royal County Down enjoys a drier climate than the rest of the Emerald Isle.The course has attracted many professionals. Tiger Woods and Tom Watson have played there for preparation for the Open Championships Rory McIlroy, Northern Ireland’s current star, often plays a round. 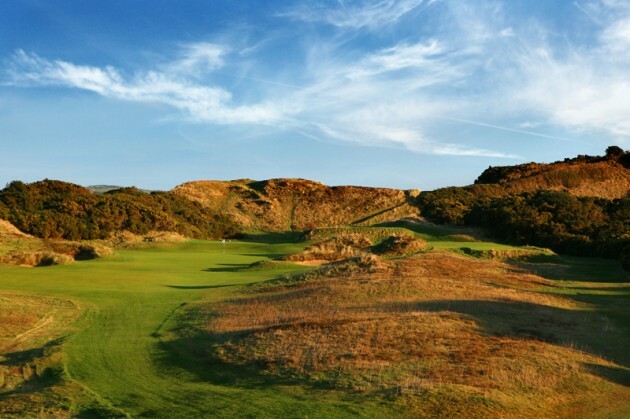 Royal County Down has hosted The Irish Open in 2015. The Royal Portrush, which is the only club in Ireland to have hosted The British Open, houses both the challenging Dunluce Links championship course and the lesser known but also challenging Valley Links course. The Dunluce Links were voted number 12 in the world by Golf Magazine. Located in the south of Ireland, Waterville hosts a practice facility and short game area with fantastic views of the Atlantic Ocean and the surrounding hills. The practice facility is surrounded by hedge walls providing relief from the winds. Called the “St. Andrews of Ireland” by Herbert Warren Wind, Lahinch features two challenging courses and hosted the South of Ireland Championship. The newly renovated Adare Manor Hotel and Golf Resort. The 18 hole championship course features aquatic challenges of a 14 acre lake in the first nine holes and the River Maigue throughout the course. Adare is a short drive from Shannon Airport.